These beetles are among the many insects in the MU Enns Entomology Museum collection. These beetles are among the many insects in the MU Enns Entomology Museum collection. No matter where you are, someday you may be able to study more than 7 million insect specimens from the Enns Entomology Museum at the University of Missouri College of Agriculture, Food and Natural Resources through an online virtual museum. CAFNR and 13 other Midwestern institutions are digitizing their collections through a grant from the National Science Foundation Advancing Digitization of Biological Collections Thematic Collections Network to help create a national resource of digital data documenting existing biological collections, according to Kristin B. Simpson, collection manager at the Enns Museum. 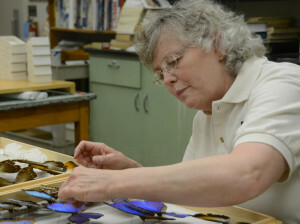 Kristin Simpson categorizes butterflies recently donated to the Enns Entomology Museum. Simpson is … Expand ▸Kristin Simpson categorizes butterflies recently donated to the Enns Entomology Museum. Simpson is the collection manager and helps oversee the lab assistants and museum events. The 10-year grant allows 160 years of accrued collections to be integrated into one central, searchable collection. When completed, standardized and curated digital photos of specimens will be available to scientists, researchers, educators and the public, Simpson said. Photographs will use modern technology, including optical 3-D imaging and reconstruction. Graduate and undergraduate students at the Enns Museum are photographing and labeling more than 3,400 drawers of pinned insect specimens, 272,720 vials and 60,000 microscope slides, Simpson said. Simpson is working on the project with representatives from the University of Illinois at Urbana-Champaign, Kansas State University, Michigan State University, University of Minnesota, South Dakota State University, University of Wisconsin, Ohio State University, Carnegie Institute, Purdue University, Iowa State University and North Dakota State University. The museum is located in Room 3-38 in the Agriculture Building on the MU campus. It is open to the public weekdays from 8:30 a.m. to 5 p.m. Group tours are available by appointment. The collection began in 1874 and is the primary source of insect and arachnid specimens representative of the Ozark Plateau. The museum is used by research and extension staff and faculty as a resource for identifications and confirmations.